Today’s guest is A. Giacomi, author of the Zombie Girl Saga, which includes Eve Brenner: Zombie Girl and a sequel, Eve Brenner: Zombie Agent. Believe it or not, but in these books, the zombie is actually the heroine! After being infected by a zombifying virus at an Ancient Egyptian burial site, Eve develops supernatural zombie powers. A Canadian born writer, educator, and artist, Ms. Giacomi is also a graduate of York University. She devours books like a bad zombie eats brains and is an all around fangirl. Favorites include Tim Burton, Shakespeare, Jane Austen, Marvel, and Star Wars. Thanks for taking my call, A.G.
Q. I’ve checked out a lot of zombie books this month and I have to say, your protagonist is the only zombie I’d actually root for. Obviously, Eve is not the traditional, old-fashioned type of zombie that shuffles slowly, has no thoughts, and just shouts “GRRR!” and “ARGGH!” Have you pretty much turned the zombie genre upside down by creating a heroic zombie? A. Ha ha I’m trying! I just can’t help but think zombies were people once, they can’t possibly lose their humanity all in one go! I’d like to think that some of us would fight off the virus fully taking over like Eve does…and besides a flu bug affects everyone differently…wouldn’t a zombie virus? Is it that far fetched that someone might actually fight their zombie qualities and try to use their last bit of life for some good? I think not! Q. Surely Eve suffers from those bloodthirsty urges that all zombies suffer from. How does she satisfy them? Should I be worried about her friends? A. She tries her best not to eat people, but you know zombies tend to get hangry. When she doesn’t feed for awhile, that’s when innocent people die. When she learns not to ignore her urges she can decide who she feasts on…she tends to stick to a diet of not so innocent people, so I’d say her friends are safe. Q. Is romance possible for a zombie? I’m thinking Eve might have some issues in that department. A. It’s possible, put her partner would have to be very patient, zombies have good days and bad days and sometimes it’s just not safe to go in for a smooch, for example if they’re hungry. Eve has a pretty big undead heart though, so she’s worth loving, she’ll fight for the ones she cares for until the very end. Q. What inspired you to get into the writing game? A. I’ve been writing since high school, I just love coming up with strange characters and inconceivable situations. I write poetry all the time as part of my daily wind-down, but as for writing books that only took place a couple of years ago. I decided to just go for it, I want to be able to tell my kids I went after my dreams and they should do the same! Q. What’s next for Eve? Is another book in the works? A. Book 3 is complete and heading into editing now, it should be out Spring of 2016! As for Book 4, I’m not sure of the release date yet, but I just completed it! It’s surreal ending a series like this, the characters have lived in my head a long time, it’s hard to say farewell to them! Q. A.G., thanks for taking the time to take my call. Before I go, do you have any last minute advice that could help my friends and I survive the East Randomtown Zombie Apocalypse? A: Hmmmm…I always say head for the hills, or at least away from other people. If we haven’t learned anything from film or television shows like The Walking Dead, it’s people that are the real danger. They get scared and lose all sense of morality, so go hide and stay hidden with lots of supplies! What an interesting concept. Never seen a zombie protagonist before! Some great books! People are definitely finding new and interesting zombie ideas! Ya but a heroic zombie? Think that’s a first, my friend. 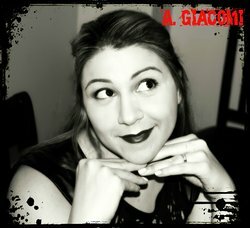 Canadian zombie author A. Giacomi stopped by on Day 28. Yes, they even dig zombies up north!